The producers of Street Food Cinema present a special edition Valentine's Day event on Thursday, February 14 at the Palace Theatre! ABOUT: While navigating their careers in Los Angeles, a pianist and an actress fall in love while attempting to reconcile their aspirations for the future. 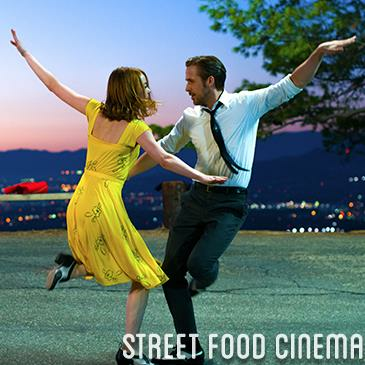 ABOUT STREET FOOD CINEMA SPECIAL EDITION: Celebrate Valentine’s Day with the cinematic love letter to the Los Angeles: LA LA LAND, a Street Food Cinema Special Edition event. Step into one of the city of stars’ most glorious, historic theaters downtown, the Palace Theatre, featuring Seb’s jazz bar with specialty cocktails, sweethearts photo booth and music by DJ Ivy. It’s sure to be a lovely night! Please Note: VIP Seating is a reserved section of the best seats in the house. Both VIP Seating and General Admission are first come, first serve. Parking not included. DOOR INFO: General Seating - $25. VIP Seating - $30. TIME: Doors 5:30p. Movie 7:30p. FOOD TRUCKS: Visit www.streetfoodcinema.com/la-la-land-valentines for the most current food truck listing! MARKET VENDORS: Visit www.streetfoodcinema.com/la-la-land-valentines for the most current market vendor listing! PARKING: Suggested lot parking at Pershing Square Garage - 530 S. Olive St., Los Angeles, CA 90014. Flat $7 for all day parking. Rates subject to change. Structure not owned or operated by SFC. Other nearby structures or lots may have cheaper prices.